This entry was posted in International Business, Misc. and tagged as i was saying, book, business, education, Future, globalization, international, international business, Marketing and Strategy, new, observations, thoughts, trade, trade policy by Michael Czinkota. Bookmark the permalink. 10/17/2016 @ 22:05:24: michaelczinkota.com does it yet again! Very informative site and a good post. Nice work! G3r15J Your style is so unique in comparison to other people I have read stuff from. Thank you for posting when you have the opportunity, Guess I will just book mark this web site. Well-written piece. I just forwarded this on 10/12/2016 to a classmate who has been doing some work of her own on this subject. To say thanks, she just bought me a drink! So, I should probably say: Cheers for the drink! 10/9/2016 @ 10:27:33 Appreciate this site– very user-friendly and tons of stuff to consider! 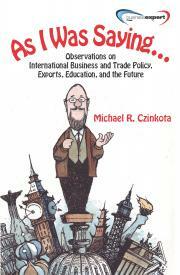 In my view, michaelczinkota.com does a excellent job of handling topics of this sort! Even if often deliberately controversial, the posts are more often than not thoughtful and thought-provoking. 10/4/2016 @ 13:31:44 says good work michaelczinkota.com! hello, quality post, and a decent understand! at least one for my bookmarks. Thank you Allen, I am glad you enjoyed it. Hope to hear more from you!